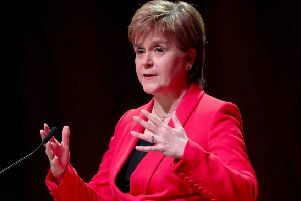 Nicola Sturgeon has insisted she is not bluffing about the prospect of a second Scottish independence referendum as she accused Theresa May of having an “unacceptable” approach to Brexit. The First Minister hinted that a “hard” Brexit could see a vote on independence within five years, but insisted that she was offering a “compromise solution” to the Prime Minister. Ms Sturgeon has indicated that “soft” Brexit could take the issue of a second referendum on Scottish independence off the table in the short term. But she told BBC One’s Andrew Marr Show that she was prepared to call a fresh vote if the terms of Brexit were not right. She said “they will be making a big mistake if they think that I’m in any way bluffing” because leaving the European Union created a “fundamental question” for Scotland. “If we’re going to be ignored, if our voice has been completely cast aside, our interests cast aside, then that can happen on anything,” she said. “And we have to ask ourselves in Scotland are we happy to have the direction of our country the kind of country we want to be determined by a right-wing Conservative government perhaps for the next 20 years, or do we want to take control of our own future? But the First Minister was critical of Mrs May’s approach to the issue and co-operation with leaders of the devolved administrations. She said that instead of “prioritising” the “sensible solution” of keeping the UK in the single market, Mrs May was trying to “appease” Eurosceptics in her “deeply-divided” party. Meanwhile, Mrs May has denied her government is suffering from muddled thinking on Brexit as she stressed the importance that will be given to gaining full control over immigration during divorce negotiations with Brussels. The Prime Minister said some people had suggested the UK could “keep bits” of EU membership as it looks to leave the bloc.